The Liebers: I'm in a Band! I was on my way to work last week and zoning out while playing Candy Crush on my phone. So you can imagine my surprise when a man gestured at the seat to my right and said "Can I sit next to you, girl?" I was thunderstruck as it was a strange way to phrase the question, but I replied, "Anything goes!" and he sat down. We chatted while riding the rock 'n' roll train and got to know each other a bit better. He told me his name was Jack, but most of his friends called him Big Jack. He said he was an electrician who works with high voltage wiring. It's a long way to the top in a dog eat dog world, but he's got a stiff upper lip and he thinks he'll get his money made. It was a nice conversation, so I was quite shocked when he leaned in and confided in me. His name isn't really Big Jack and he's not really an electrician! He was actually named Brian and he is the lead singer of a little band you might have heard of: AC/DC!! He went on to say that they haven't been eating well on tour and they've been getting kind of bored between sets. They had read my blog and enjoyed my recipes and craft projects. They wondered if I might be interested in going on tour with them next month as they tour their homeland of Australia! They must have also read about how much I've always wanted to visit! My first response was "Let there be rock! Girls got rhythm too!" I went on to ask if the family was invited to come along because that's the way I wanna rock 'n' roll. I was excited when he said that was the plan all along. 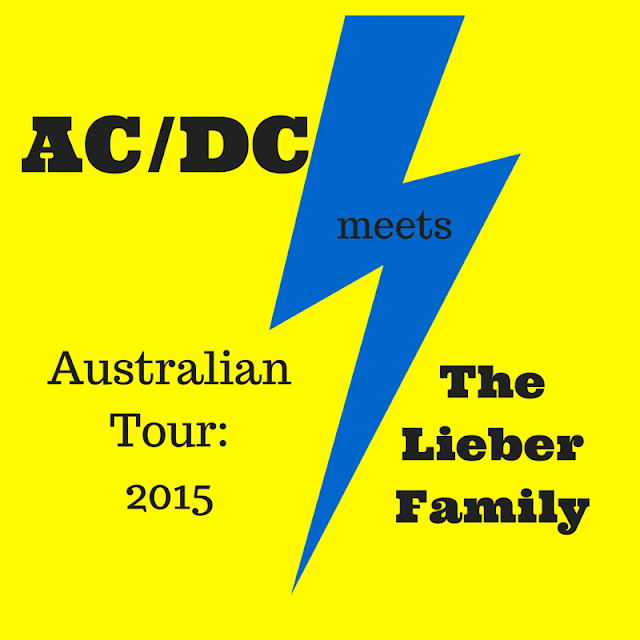 So starting next month, the Lieber family is headed to Australia to tour with AC/DC. I'll be cooking and crafting with the band in between sets and we'll be touring Australia as well. I'm totally overwhelmed with this opportunity and I can only image the fun we'll have. Stay tuned to see if this turns out to be the highway to Hell or a a great way to rock the blues away! As they say "Rock or Bust!" P.S. In case it wasn't already obvious, this piece is some fun fiction. It's actually part of the July Secret Subject Swap. This week 12 brave bloggers picked a secret subject for someone else and were assigned a secret subject to interpret in their own style. Today we are all simultaneously divulging our topics and submitting our posts. My subject is: AC/DC is on tour. They adopt you as an additional band member. Tell us about your role and your adventures on and off the stage! Also, I have hidden 17 AC/DC song titles in this post. Can you find them all? What a fun post topic and blog swap!! Haha, don't you wish!! Great piece! With my family a trip like this might tend more towards the "Highway to Hell" path! You almost had me, there... The blog reading thing, well, you never know. But, when you got to the bit about him being the lead singer, I knew there was no way he wouldn't have been mobbed. Very Good spoof! Cooking and Crafting with AC/DC, epic!! Maybe you'll be their Mistress for Christmas? They were playing in Zurich, Switzerland, the night I handed in my prompt to Karen. Thunderstruck is my favorite! Isn't it interesting how "all" of my prompts take you to Down Under. I think it's more than beating around the bush - it's a sign. Just ride on! Hells Bells!!! OMG I used to listen to that over and over again. I can always rock out to some good ol' AC/DC, especially Back in Black and Shook Me All Night Long! Too bad they don't need a mom blogger to do crafts with though lol. LOL! My daughter read this and got all excited until I told her it was a joke! There's some good road trip music here, that's for sure!! Maybe it's a sign that I'll make to the land down under someday!! I had fun writing it. The research wasn't too hard. LOL! My daughter believed it too!